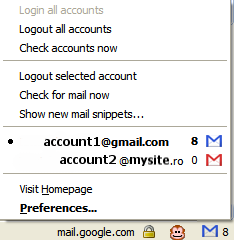 A useful feature of Gmail Manager, a great Firefox extension that notifies you when you receive new Gmail messages, is that you can easily log in to a different Gmail account without entering the username and password: after adding your Gmail accounts and Google Apps accounts, select the account by right-clicking on the Gmail Manager icon in the status bar and then click on the icon. Another way to easily switch between your Gmail accounts is the Google Account Multi-Login Greasemonkey script, but it stores the passwords in a non-secure way. If you want to minimize the number of times you access your secondary Gmail accounts, forward all the messages to your main account and enable it to send messages using custom From: addresses. This is cool but probably they have to make it more secure. And I believe most of the peoples have more than one gmail account. this isn't a reply sorry, i couldn't figure out how to post. my comment is why is it so hard to switch accounts and why on earth isn't there an icon on the gmail page to do that...ugh. But will it work with Google Apps? Everybody with Google Apps has a base google account too, which means they almost always have two gmail accounts to log in to. Google used to have something in their ToS about not allowing multiple accounts. Did they ever take that out? Unless so I'd be afraid to admit that I had two accounts (if I did, hehe). At least it seems we should not worry anymore, afterall tracking duplicate accounts isnt that easy for google. you can not use "an" article before words which are pronounced like /you/. "an useful" is wrong. The upside of google apps accounts is you can log into each domain once. I have 3 google accounts and can switch between them at will. It's worth mentioning that Gmail Manager has been acting weird lately, like not showing new mails on the inbox. Google Talk reports the new mails but Gmail Manager doesn't. Gmail Manager works well with Google Apps accounts. No, somebody misread the TOS and created this weird legend. Gmail's program policies say you must not "create multiple user accounts in connection with any violation of the Agreement or create user accounts by automated means or under false or fraudulent pretenses". Thanks for noticing my mistake (English is not my first language). You may store different information in other Google accounts. Installed this early this morning. Loving it already! I too would love to have this extended to more than just Gmail. Google Apps, Reader, Analytics, Adsense and Adwords to name a few. Hopefully this will be in a future release? Pretty please? So it shows your other email account which defeats the purpose of having another account for other types of mail - ie friends, work etc..
"Hopefully, Google will add a feature that lets you link a main Google account with your other accounts and log in once to access all your Google accounts"
"Associate email addresses with your account, Adding email addresses helps Google associate useful information with your Google Account. For example, Google Calendar can show invitations sent to any of your addresses." The idea is to have accounts for different activities and to avoid any linkages between them. I want to open each account when it is needed. recently, firefox upgraded to the 3.0 version in a mass download. i was part of that..and now I am very sorry, as now I can no longer view videos [youtube or anyplace else] unless I open IE and my gmail manager is so screwed up!! it pops little windows up asking for login to all my accounts, but never actually does the login. so I have had to uninstall it and gmail notifier, which also has a mind of its own and is on a permanent coffee break. i sure miss the convenience of checking my accounts and knowing how many items were in each account,, whether labels or inbox and I really hate to have to use IE to see any videos. However, I got a new phone yesterday and note that the google mail application has the function to switch between accounts, keeping you logged in at all times. It is excellent, and a huge improvement on the previous version of the app. I use the Firefox Gmail manager. It allows you to check your email but I don't think it allows you to send from different accounts does it? Anonymous, what is the name of the iPhone application that allows you to switch? Is there away to do this in chrome? @Dierdre, not as far as I know. I think at the moment Chrome is still quite new but the plugins are eagerly anticipated. I'm sure as soon as people start developing plugins for Chrome it will be took up by geeks and become huge. I've had problems with the greasemonkey script whereby it only switches the account depending on what section of google you are in. For instance if you are in Analytics, Website Optimizer or Webmaster tools, it appears to break somewhat. Still, its pretty decent compared to the other option of keep loggin in and out. Another easy solution is to just add your other gmail accounts in your master gmail account. 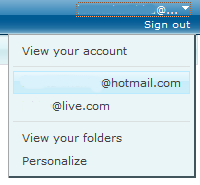 You can set up labels to organize the other accounts and also send email as the other accounts with no problem. I just tested this feature and it's working great. Help to manage multiple gmail accounts for our needs. Google keep adding more and more features. Some of us have alternate gmail accounts that we wish to remain private from our formal identities. For instance, this is my gaming name, here. I don't wish my gaming identity to be assosiated with my real life identity, therefore I wish to be able to easily switch between the 2. You all keep talking abuot gmail only. There are hundreds of other apps that require google logins, and this is what the rest of us need/want. In Chrome, use incognito for 2nd account. Works fine. Sign into your main gmail account ----> Settings---->Accounts and Import---->Change Account Settings (at the very bottom)---->A new window pops up---->Under personal settings, last option is multiple sign-in---->Turn this option on and check any applicable check boxes. how to delete the switching between accounts in gmail? Working Fine with me. logged 5 account and switched perfectly. i do not prefer to use Greasemonkey. it kept my browser slow. You can try Gmail Toolbox, a chrome extension, it can switch sender automatically when you have multiple gmail accounts. I have gone through all the comments and mostly everyone has tried to give the best solution. But even if your are not satisfied or uncertain then you can contact Toll-Free Support Number specially designed for the population of Australia @1-800-057-707. You will get the best solution from the experts.